Ozobot Evo Iron Man Robot: a STEM robot that gets your children familiar with the basics of coding. The robot has color & line detection, proximity sensing, and iOS/Android support. Iron Man Arc Reactor Ring: a geeky ring with LEDs, solid metal alloy construction, and enameled metallic finish. It illuminates for 60 seconds on tap. Beast Kingdom Levitating Iron Man Suit: so levitating gadgets are your thing? This cute toy is worth a look. It has LED eyes, chest reactor, and feet. The levitation base also glows. 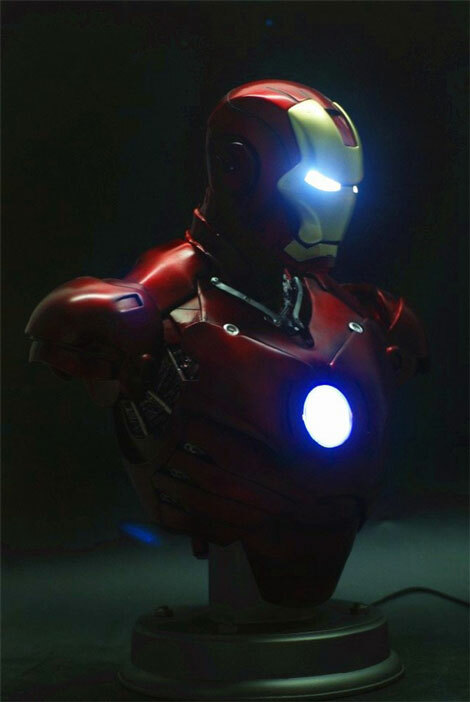 Gmasking Iron Man Light-up Bust: a 1:2 replica with LED light-up eyes and Arc Reactor. 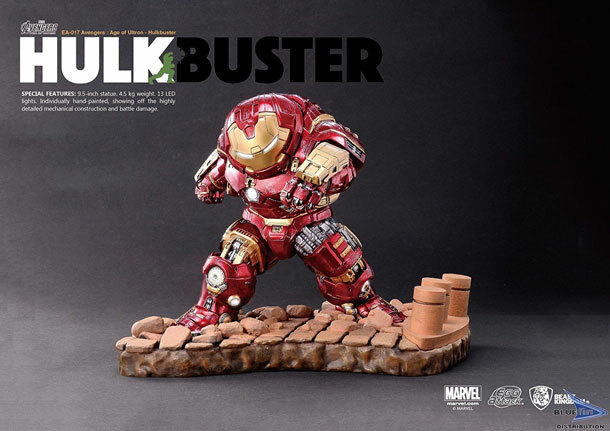 LED Light Up Hulkbuster Action Figure: has intricate details from the movie. The statue has LED lights in its eyes, arc reactor, thruster, and knees. Onnit Iron Man Kettlebell: lets you exercise like a superhero. It is modeled after Iron Man’s helmet and weighs 40lb. 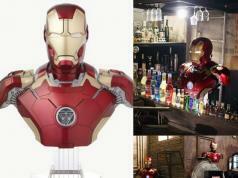 3D Iron Man Mask Wall Light: gives your man cave a geeky makeover. Looks cool day and night. 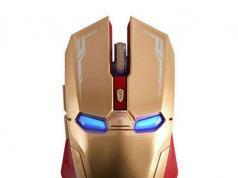 Gmasking Electronic Iron Man Helmet: made of aerospace aluminum, this helmet electrically opens/closes and has LED light-up eyes. Iron Man Mk44 Hulkbuster Helmet Speaker: not only plays your music but also has a USB power output port. It is compatible with your smartphone, tablet or PC. Gmasking Motorized Iron Man Gauntlet: a motorized wrist armor with blasting sounds and LED light. Great for Halloween, cosplay, and other occasions. Iron Man MK45 PC Case: a powerful machine with an i7 5820K processor, NVIDIA GTX 1080 8 GB graphics card, 240GB SSD, and 32 GB RAM. It is amazingly detailed and has LED fans. Killerbody Iron Man Armor: made of metal and ABS, this armor comes with smart speech recognition and voice control. 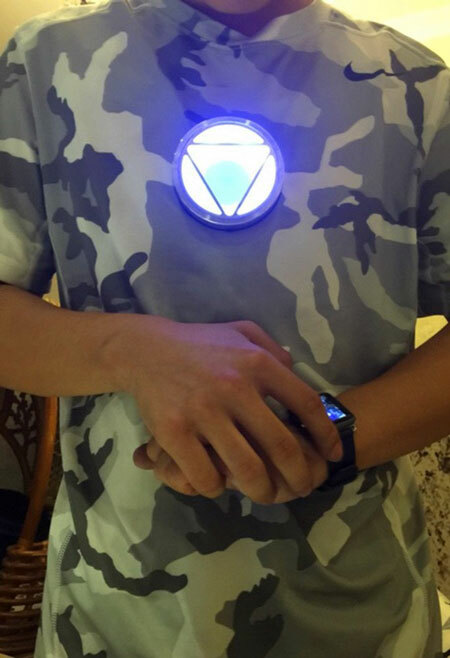 Gmasking Iron Man MK5 Wearable Arc Reactor: another wearable Arc Reactor with batteries, charging port, and everything you need for cosplay events. 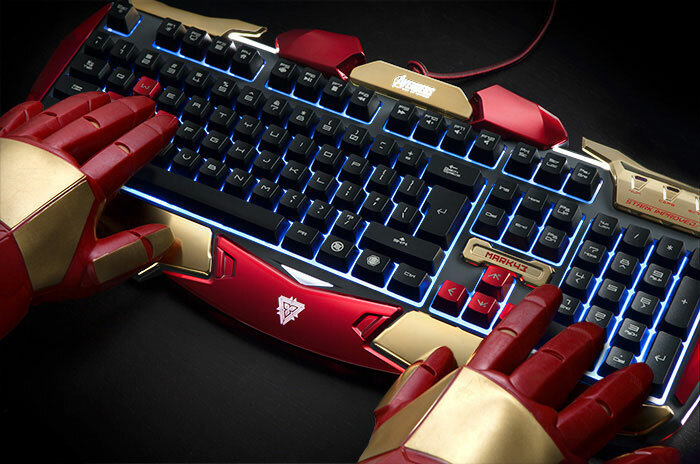 Iron Man Gaming Keyboard: modeled after the Mark 43 armor. It has backlit keys with 3 customizable color effects. 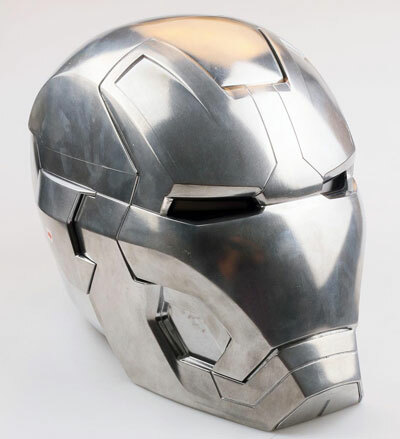 Iron Man Mark 42 Electronic Helmet: an auto light-up, electronically controlled mask. It is made of ABS/PVC and runs on 4 AAA batteries. 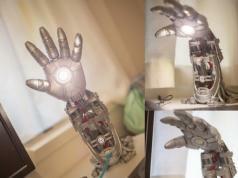 DIY Bionic Iron Man Glove: this project involves building an Iron Man Glove with MyoWare muscle sensor and a NeoPixel 12 LED ring. 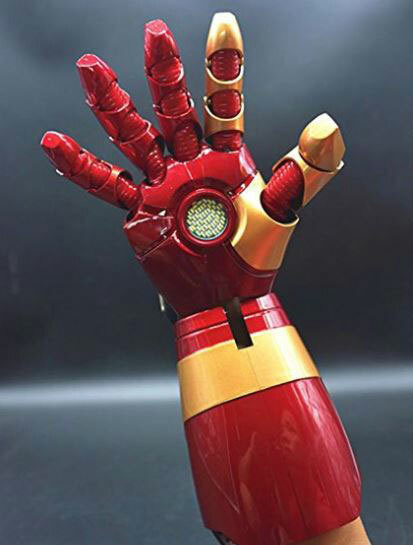 Dual Laser Iron Man Glove: lets you shoot lasers from the palm of your hand. It also comes with sounds. Iron Man’s Arm-Missile: has a laser and can fire a rocket. Great for killing balloons and everything in between. 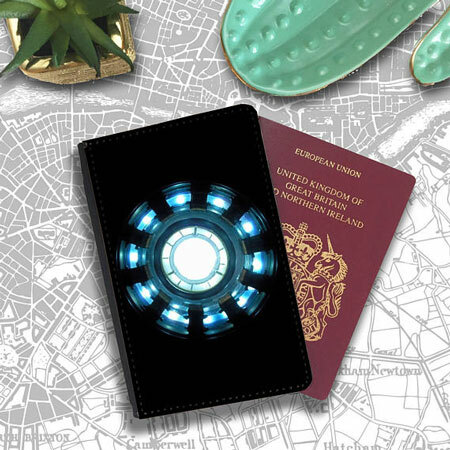 Arc Reactor Passport Holder: a cool password cover with a glossy canvas front panel. It protects your passport, notes, and everything in between. 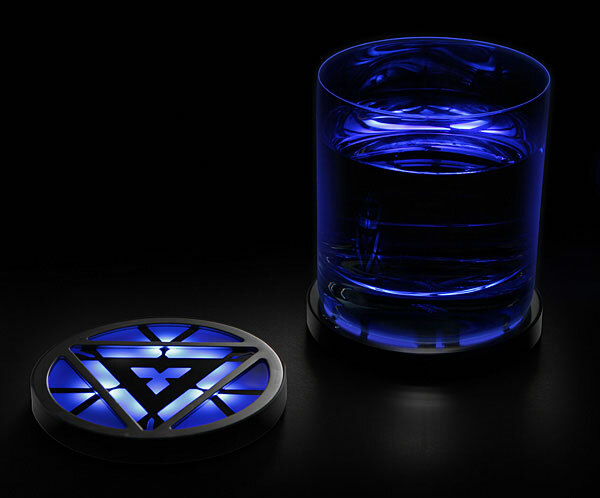 Marvel Iron Man Arc Reactor Light-Up Coasters: made of aluminum, LEDs, and plastic. It comes with on/off switch on the bottom. Iron Man Hand LED Wall Light: another 3D wall light that looks stunning in dark rooms. Comes with a crack sticker for a more realistic look. 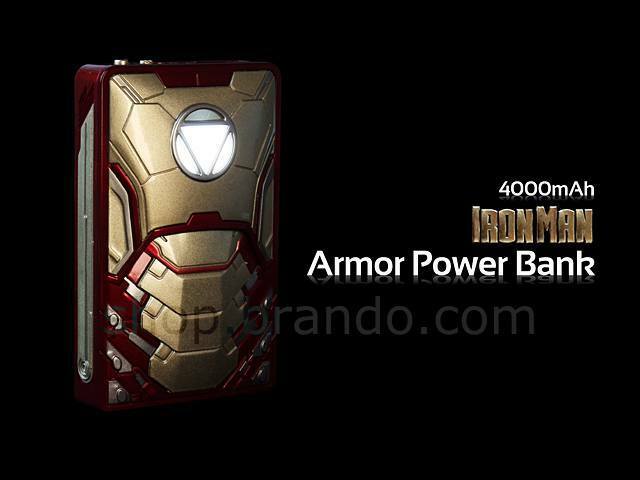 Iron Man Armor Power Bank: this phone charger has 4000 mAh battery with sound effects and light. 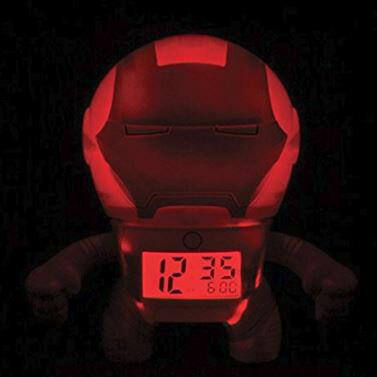 BulbBotz Iron Man Light Up Alarm Clock: a cute little alarm clock with a light-up head. It stands 7.5 inches tall. 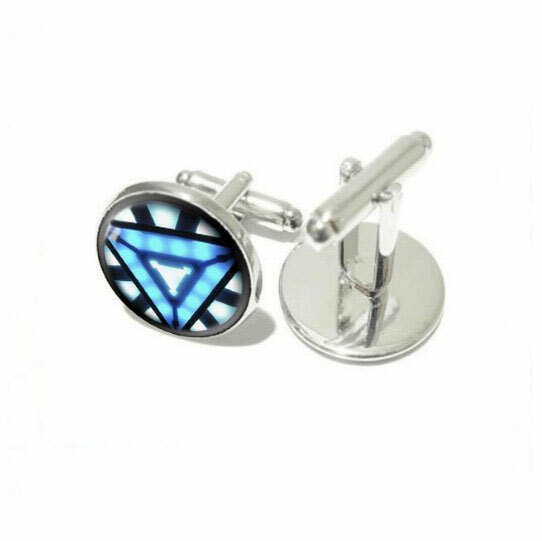 Iron Man Glass Cufflinks: great for geeky gatherings. Pretty affordable too. Iron Man Blue Eyes Glow In the Dark Wall Art: it absorbs natural or artificial light and glows in the dark. 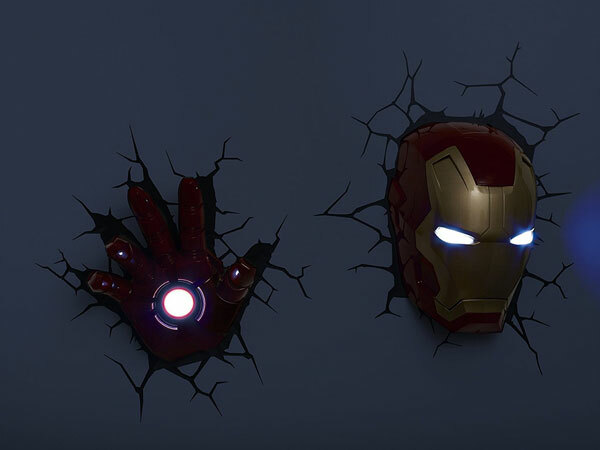 Iron Man Wallbreaker: brings a cool Iron Man wall art to your place. It has a lightweight foam construction. 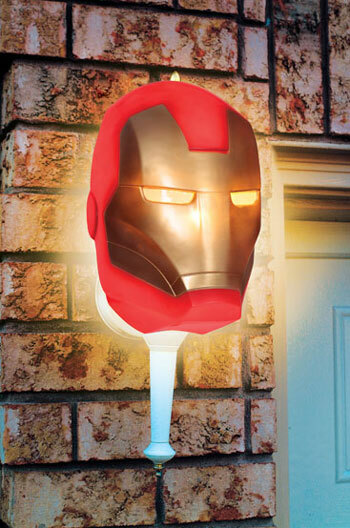 Iron Man Porch Light Cover: a geeky light cover you can cut to fit your light fixture. It attaches with an elastic band. 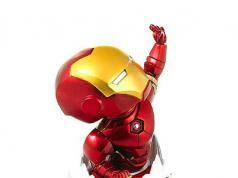 Have you found cooler Iron Man gift ideas? Please share them here.